The original recipe called for a chocolate cookie crust, but I thought that nuts and chocolate go so nicely together that a walnut crust would be divine. I also added some raspberries as decoration on top of the cheesecake for a tart contrast to the sweet cheesecake. The resulting product was just as divine as I imagined, and received rave reviews from all family members. I must warn you that this cheesecake is quite formidable, and only the smallest slice is manageable if one wishes to be fully functioning after consuming it. 1. Use a food processor or a knife to finely chop the walnuts. 3. Bake in a 400 F oven for 10-12 minutes. The edge should be golden brown when done. 4. Cool on a rack. Reduce the oven temperature to 350 F to bake the cheesecake. 1. In a sauce pan on med/low heat combine the cream and the chocolate chips, stirring frequently until the chocolate melts and the mix becomes smooth with no lumps. Set aside to cool. 2. Using a food processor or electric mixer, combine the cream cheese and sugar until fully blended. The next ingredients must be added and mixed in the following order for the most success. 3. Add the cornstarch and mix well. Then fold in the sour cream and vanilla, and again mix well. Add the yoghurt or egg replacers, mixing well, and then add the cooled chocolate mixture from step 1, mixing again until it’s smooth with no lumps. 4. Pour the entire mixture onto your pre-baked nut crust, and bake in your preheated 350 F oven until the center is set and the edges are a little puffy. This takes approximately one hour. 5. Remove from oven and allow to slowly cool at room temperature for at least an hour. Cover and place in the refrigerator to chill overnight. 1. In a small saucepan heat the cream until it begins to boil. 2. Take the cream off the heat and add in the chocolate, mixing until it is fully melted and the mixture is smooth. 3. Pour the ganache mixture over the top of the already chilled cheesecake and smooth with a spatula. Place the cheesecake in the refrigerator again until the ganache is set, about 2 hours. 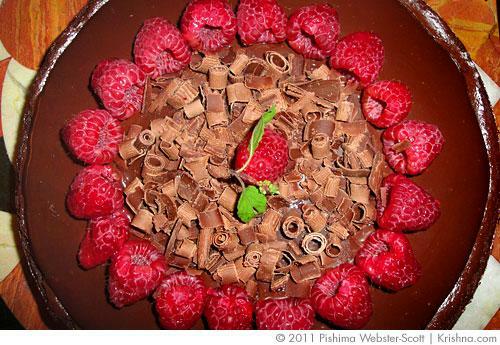 For the picture I decorated the cheesecake with some fresh raspberries and some chocolate curls I made by using a vegetable peeler on a bar of chocolate. [Editor's Note: For a long while, chocolate was not on the ingredient list for Krishna conscious cooks. There is a minor amount of caffeine in chocolate, and caffeine is something we try very hard to avoid. In recent years, chocolate has officially been put back on the ‘friendly’ list, with the stipulation that it’s still not offered at temples or to deities. Many Krishna conscious followers continue to refrain from chocolate for various reasons, and they turn to carob as a substitute. If you are familiar with baking with carob, you might like to adapt this recipe for carob instead. If you have success with carob, we would love to hear how you were able to adjust the recipe so we can share this with others interested in making carob cheesecake. Submitted by Anonymous on Sat, 05/28/2011 - 09:24. When did it become acceptable to offer chocolate? Submitted by Anonymous on Tue, 08/09/2011 - 05:55.